6 ft, 8 FT, 10 FT,12 FT MESSAGE FLAGS, DURABLE NYLON , MADE IN THE USA, MESSAGE FEATHER FLAGS, MESSAGE FLUTTER FLAGS, MESSAGE RECTANGULAR FLAGS. CHOOSE YOUR COLOR AND MESSAGE. TELESCOPING FLAGPOLES SOLD SEPARATELY. No Poles, use your own poles 1-1/4" diameter. 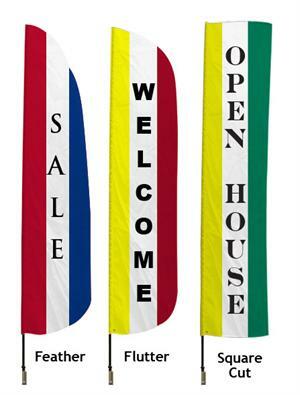 FEATHER MESSAGE FLAGS WILL ATTRACT CUSTOMERS TO YOUR BUSINESS. CUSTOMERS WILL SEE YOUR LOCATION AND ADVERTISING FLAG. CHOOSE YOUR COLOR, MESSAGE, AND SIZE. 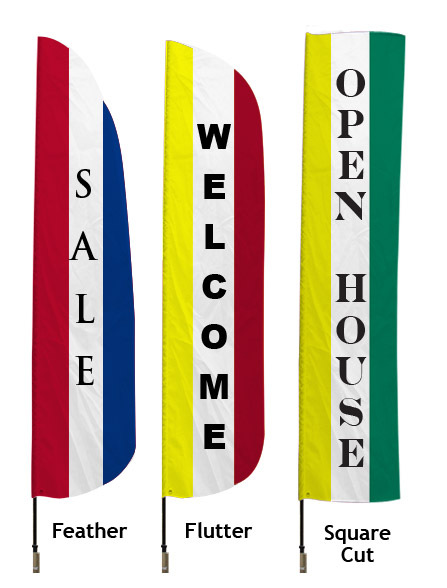 OPEN HOUSE FLAG, WELCOME FLAG, SALE FLAG, LEASING FLAG, NOW LEASING, OPEN FLAG, MODEL FLAG, WE FINANCE FLAG, MODELS FLAG, NOW LEASING FLAG, NEW CARS FLAG, USED TRUCKS FLAG, USED CARS FLAG. SPECIALS, STORAGE, SELF STORAGE,. ALL OUR FEATHER FLAGS ARE ON SALE RIGHT NOW. CUSTOM MESSAGES AVAILABLE, FEATHER FLAGS 8 FT TALL, FEATHER FLAGS 10 FT TALL, FEATHER FLAGS 12 FT TALL, FEATHER FLAGS 15 FT TALL . USE YOUR OWN FEATHER FLAGPOLE OR PURCHASE OUR LONGEST LASTING FEATHER FLAGPOLE 15 FT.